Living and working in New York and providing expert cosmetic and laser surgery services to many people from all over the world with different socioeconomic backgrounds, you just come across any and all types of requests and that makes my job that much more enjoyable and challenging. Many people are visiting from abroad and simply do hot have the luxury of time to have permanent solution fix with surgery. Other people simply do not want to have any scars on their faces or loose any skin sensitivity, as it is a common side effect after chin implantation surgery. With the advances in dermal fillers, Dr. Avaliani is able to offer a super quick, painless and temporary solution to people bothered by their profile views. Juvederm® and Restylane® fillers offer a great “try on” solution by allowing people to try on a new look aka new chin, before committing to something permanent, like an implant. HA fillers are great as they are also reversible in case there is something that is drastically different in the profile and maybe people simply cannot embrace their new look. What are other common concerns expressed around chin area? Some people are bothered by a fold between the lower lip and the chin angle. This concern is easily corrected in one procedure by filing the space with Juvederm® and Restylane® fillers and currently there is a great variety of hyaluronic acid fillers to choose from. 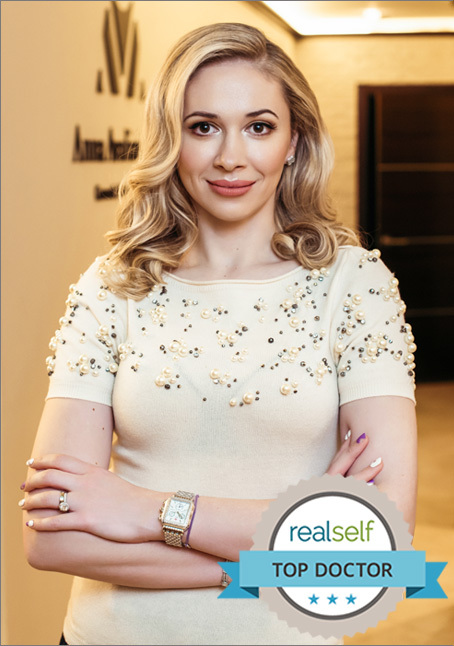 Dr. Avaliani will help you determine which Juvederm® and Restylane® family of fillers will work the best as she carries a full line of latest products on the market. Some people are bothered when they see wrinkles on their chins when they grimace or smile. Chin wrinkles can easily be smoothed out with a combination of neurotoxin like Botox® or Dysport® and dermal fillers.